At the end of the 19th century, physicians first realized that transferring tendons could restore function to an extremity. The crippling results of the polio epidemic in Europe contributed to the advancement of tendon transfers. In addition, as anesthesia and aseptic techniques developed, the skills and technical acumen of surgeons improved. 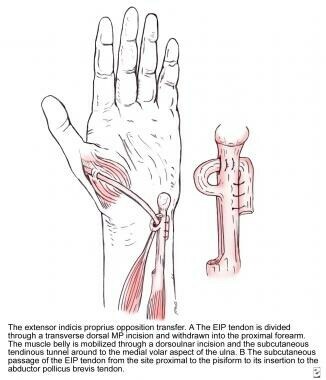 Opposition tendon transfer using the extensor indicis proprius (EIP) to insert onto the abductor pollicis brevis (APB). MP = metacarpophalangeal. For patient education resources, see Ruptured Tendon. At the palm, the flexor digitorum superficialis (FDS) tendon lies volar to the profundus tendon. It then splits at the level of the proximal phalanx and reunites dorsal to the profundus tendon to insert in the middle phalanx. The flexor digitorum profundus (FDP) perforates the superficialis tendon to insert at the distal phalanx. The relationship of flexor tendons to the wrist joint, metacarpophalangeal (MCP) joint, and interphalangeal (IP) joints is maintained by a retinacular or pulley system that prevents the bowstringing effect. For more information about the relevant anatomy, see Hand Anatomy, Flexor Tendon Anatomy, and Wrist Joint Anatomy. The basic concept to remember in tendon transfer surgery, as advocated by Brand, is achieving balance in the extremity. Balance surpasses strength; one must strive to achieve equality in the distribution of the forces, relocation, and replacement of tendons. If a tendon transfer cannot be performed, other options include free muscle transfer, intercalary tendon graft, tenodesis, tendon lengthening, and arthrodesis. Approximately 9-12 months after a nerve repair, the maximum nerve regeneration has occurred. (Nerve regeneration occurs at a rate of approximately 1 mm/day.) Kallio et al reported that better results are obtained with neurorrhaphy if the gap is less than 5 cm. In a 1970 article, Brown discussed the factors that contribute to a poor prognosis due to nerve repair, including a gap greater than 4 cm, a large wound, extensive scarring, and skin loss. Nerve grafting should be considered if undue tension on the direct neurorrhaphy exists. Amplitude, or potential excursion, is proportional to fiber length. In the image below, x equals the excursion length with traction minus the resting length; y equals the resting length minus the length at full contraction; and amplitude is equal to x plus y. Usually, the two measurements are equal. Total excursion of muscle equals excursion with contraction and traction; these lengths usually equal each other. x = excursion length with traction – resting length; y = resting length – length at full contraction. Amplitude = x + y.
Amplitude can be augmented by various means, such as freeing muscle from fascial attachments or transferring a monoarticular muscle to a multiarticular muscle (ie, transferring the FCR to the extensor digitorum communis [EDC]). 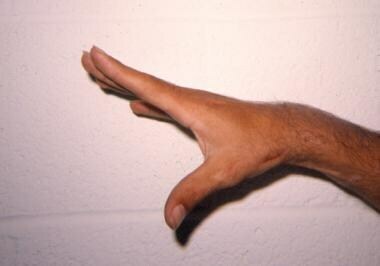 Volar flexion of the wrist increases amplitude by 2.5 cm via the tenodesis effect (see the image below). This figure demonstrates the tenodesis effect of wrist flexion, which augments amplitude by 2.5 cm. The first three steps in the above list are also referred to as the three-column theory or principle for tendon transfers. Drawing out these steps in three columns facilitates the decision-making process. Seddon's method for determining how long to wait before exploring the nerve involves measuring the distance from the fracture site to the brachioradialis innervation point (2 cm proximal to the lateral epicondyle) and adding 30 to this number. The total number is then the number of days to wait before exploring the radial nerve. The radial nerve is mostly a motor nerve, and reinnervation is usually apparent within 4-6 months after an uncomplicated neurorrhaphy. During the prolonged recovery time, an end PT–to–side ECRB transfer can be performed at the time of nerve repair to provide wrist extension as an internal splint. The tendon transfer is performed in an end-to-side manner so that if reinnervation occurs, the continuity of the reinnervated ECRB is not lost. Low-profile dynamic splints can be worn during the day, with night splints maintaining the digits and wrist in extension. All joints must maintain full passive range of motion, including the first web space. During World War I, Sir Robert Jones developed a set of tendon transfers for radial nerve paralysis, which formed the basis for reconstructive tendon transfer surgery. The transfer included the PT to the ECRL and ECRB; the FCU to the EDC III-V; and the FCR to the EIP, EDC III, and EPL. Many modifications have been made to this plan, primarily maintaining a wrist flexor. For wrist extension, the most common transfer used is that of the PT (universal donor) to the ECRB (central wrist extensor), positioned superficially to the brachioradialis and ECRL. As discussed, this can be performed initially as an internal splint at the time of nerve repair in staged tendon transfers. Including the radius periosteum can lengthen the PT. In a 1989 report, Tubiana et al recommended freeing the PT proximally to improve excursion. The tendon transfer should not create a new deformity or decrease function. The Boyes transfer uses the ring-finger FDS transfer to the EPL and EIP and the long-finger FDS transfer to the long and ring fingers' EDC and EDM. The FDS travels through the interosseous membrane. This transfer can be used if independent digital extension is required. Wrist motion is preserved for the tenodesis effect, thereby providing an additional 2.5 cm of tendon excursion to augment wrist amplitude in flexion. The disadvantages of this tendon transfer, however, include a possible weakened grip, an out-of-phase transfer (transferring a flexor to an extensor), increased difficulty in the patient learning—requiring motoric reeducation—and loss of independent flexion of the donor finger. The transfers for thumb extension include the PL over the first dorsal compartment to the EPL, which is released from the third dorsal compartment (EPL rerouting). The EPB can be added to the EPL for additional metacarpal extension. In approximately 20% of the population, no PL is present. The long FDS can then be used either through the interosseous membrane or radially around the wrist to attach to the EPL. The APL is the major thumb metacarpal extensor; if APL function is not restored, a flexion adduction contracture of the thumb results. This can be avoided with tenodesis of the APL around the brachioradialis insertion (see the image below) or with transfer of the FCR to the EPB and APL and transfer of the FDS to the EPL and digit extensors. Tendon transfer for high radial nerve palsy. The pronator teres (PT) inserts onto the extensor carpi radialis brevis (ECRB). 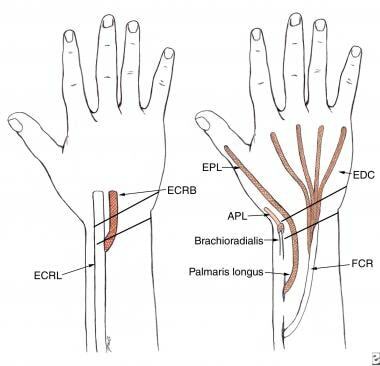 The palmaris longus (PL) inserts onto the extensor pollicis longus (EPL) and the extensor pollicis brevis (EPB). 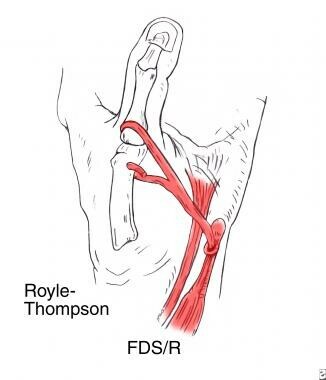 The flexor carpi radialis (FCR) inserts onto the extensor digitorum communis (EDC). Tenodesis of the abductor pollicis longus (APL) around the brachioradialis helps to avoid a flexion adduction contracture of the thumb. Distal radial nerve paralysis involving the PIN may preserve the ECRL, resulting in wrist radial deviation. The ECRL can be transferred to the ECRB or ECU to resolve the radial deviation (see the image below). The FCU should not be used for digital extension in PIN paralysis because the radial deviation increases. Low radial nerve palsy. Extensor carpi radialis brevis (ECRB) tenodesis to the extensor carpi radialis longus (ECRL) to compensate for radial deviation. APL = abductor pollicis longus; EDC = extensor digitorum communis; EPL extensor pollicis longus; FCR = flexor carpi radialis. One year before presentation to the authors, a right hand–dominant 30-year-old man was treated for a gunshot wound to the left upper extremity. Injuries included a humeral fracture and brachial artery injury. 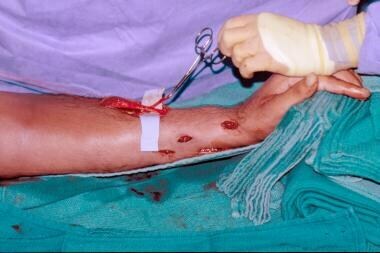 External fixation and repair of the brachial artery were performed (see the first image below). The patient presented approximately 1 year after the initial injury with the inability to extend the wrist, MCP joints, and thumb on the affected side (see the second image below). Radiograph obtained after an initial external fixation and brachial artery repair for a gunshot wound to the left upper extremity with a humeral fracture. Same patient whose humerus was fractured by a gunshot wound to the left upper extremity. Preoperative photo of an upper extremity that demonstrates radial nerve palsy. Note the absence of wrist, metacarpophalangeal, and thumb extension. The median- and ulnar-innervated muscles functioned well and were available for tendon transfer. 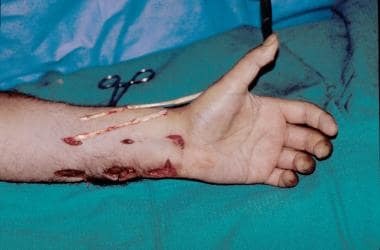 The patient was taken to the operating room, where the radial nerve was explored through a lateral arm incision (see the first image below). No transection of the radial nerve was found. Significant axonal injury was the likely reason for this patient's left-upper-extremity dysfunction (see the second image below). Same patient whose humerus was fractured by a gunshot wound to the left upper extremity. 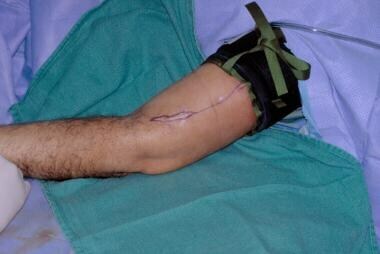 Lateral arm incision for exploration of the radial nerve. Same patient whose humerus was fractured by a gunshot wound to the left upper extremity. The radial nerve is dissected free, demonstrating no transection. Same patient whose humerus was fractured by a gunshot wound to the left upper extremity. Tendon transfer from the palmaris longus (PL) to the extensor pollicis longus (EPL). Same patient whose humerus was fractured by a gunshot wound to the left upper extremity. 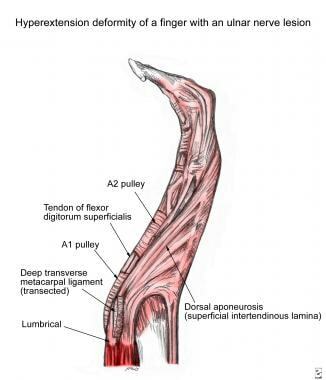 Tendon transfer from the flexor carpi ulnaris (FCU) to the extensor digitorum communis (EDC). Same patient whose humerus was fractured by a gunshot wound to the left upper extremity. Tendon transfer from the pronator teres (PT) to the extensor carpi radialis brevis (ECRB) and extensor carpi radialis longus (ECRL). The technique of a Pulvertaft weave was used for the transfers, with 3-0 polypropylene. The periosteum was harvested with the PT for additional length. The wrist was positioned in 30° of extension, the MCP joints in 30° of flexion, the digital interphalangeal (DIP) joints in extension, and the thumb in abduction and flexion. Postoperatively, the patient did well and regained wrist, MCP joint, and thumb extension (see the image below). Same patient whose humerus was fractured by a gunshot wound to the left upper extremity. Postoperative photo of an upper extremity with successful wrist, thumb, and digit extension following tendon transfers. Proximal or high median nerve injury results in loss of opposition, as well as thumb IP joint and index finger DIP joint flexion. For thumb flexion, the brachioradialis can be transferred to the flexor pollicis longus (FPL). This transfer weakens with elbow flexion and requires brachioradialis mobilization to increase the excursion. If the long-finger FDP is innervated by the ulnar nerve, then the long-finger FDP can be transferred side-to-side to the index-finger FDP. If the long-finger FDP is innervated by the median nerve, use the ring-finger FDP side-to-side transfer to the long and index fingers' FDP. If significant radial-side strength is needed, the ECRL can be transferred to the index-finger FDP. Thumb opposition is a combination of trapeziometacarpal and MCP joint abduction, flexion, and pronation (see the image below). Position takes precedence over force for intact opposition. Proper positioning includes having the nail plates of the thumb and long finger in the same plane. 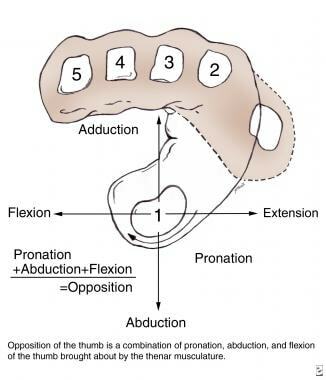 The different components of thumb opposition: flexion, pronation, and abduction. 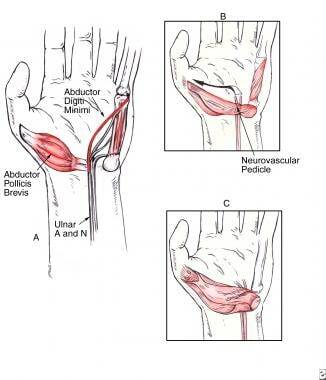 Distal median nerve injuries involve loss of opposition because of paralysis of the abductor pollicis brevis (APB), opponens pollicis, and superficial head of the flexor pollicis brevis (FPB). The APB appears to be the most important muscle in opposition. If a first web space contracture is present preoperatively, this condition must be corrected before performing the tendon transfer (see the image below). One method to repair a first web space contracture using a dorsal rotation flap with contracture release. Steindler performed the first opponensplasty in 1919 by transferring the radial slip of FPL to the dorsal base of the thumb proximal phalanx. Several more options have since been developed for opposition transfers. In these transfers, the APB insertion is approached at approximately a 45° angle from the pisiform. If abduction and flexion are created, pronation occurs passively. Aguirre and Caplan in 1956 and Burkhalter et al in 1973 described transferring the EIP to the APB, which is the most common transfer to restore opposition (see the image below). [39, 40] The advantages of this transfer include no requirement for a pulley or tendon graft, no loss of grasp force, and avoidance of dissection in scarred tissue. The disadvantage is that the length of the EIP is just enough to transfer to the APB. When the EIP is mobilized, the extensor hood overlying the index finger should be repaired to prevent an extension lag. Bunnell in 1924, Royle in 1938, and Thompson in 1942 described transferring the ring finger FDS to the APB (see the first image below). 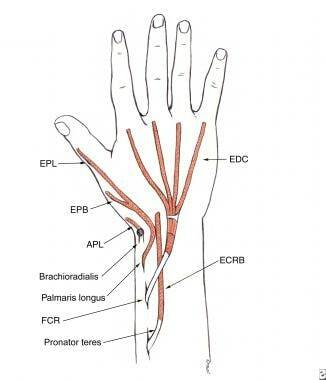 [2, 41, 42] The ring-finger FDS is divided at its insertion and passed around the ulnar border of the palmar aponeurosis. A pulley can be created from the FCU or PL (see the second image below). Note: This transfer cannot be used in a high median nerve injury, because the ring-finger FDS is paralyzed. The Royle-Thompson opposition transfer: the ring finger flexor digitorum superficialis (FDS/R) attaches to the abductor pollicis brevis (APB) and the metacarpal head with a flexor carpi ulnaris (FCU) pulley. Creation of the flexor carpi ulnaris (FCU) pulley in a Bunnell opponensplasty. MP = metacarpophalangeal. In the Camitz procedure, also advocated by Bunnell, the PL is transferred in a subcutaneous tunnel to the APB (see the images below). 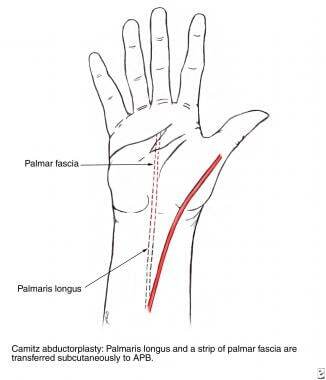 Camitz abductorplasty, in which the palmaris longus (PL) is transferred to the abductor pollicis brevis (APB). Postoperative photo of a hand following a Camitz abductorplasty. Postoperative photo of the same hand following a Camitz abductorplasty. This image demonstrates the proper postoperative position of thumb abduction. In the Huber procedure, the abductor digiti minimi (ADM) is transferred to the APB. This tendon transfer is especially useful for thumb hypoplasia because it creates thenar bulk. The neurovascular bundle, which is found on the dorsoradial aspect of the ADM, is preserved. If the pisiform origin is preserved, a tendon graft may be required, but better blood supply is retained (see the image below). The ADM muscle is mobilized to the pisohamate origin and is rotated 180° so that the superficial side becomes deep and radial through the subcutaneous tunnel. Huber procedure for opposition transfer. 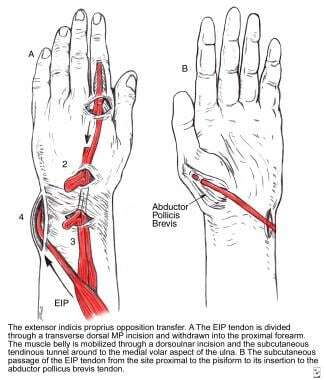 The abductor digiti minimi (ADM) is transferred to the abductor pollicis brevis (APB). Ulnar A and N = ulnar artery and nerve. Tendon transfers for ulnar nerve injuries have less predictable results than those for radial nerve injuries. 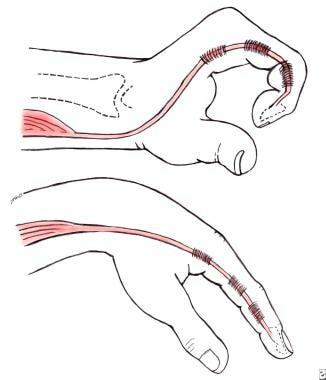 Distal power pinch involves the adductor pollicis and the first dorsal interosseous muscles for index finger abduction. Approximately 33-50% of grip strength is lost in ulnar nerve paralysis. Hyperextension deformity in ulnar nerve paralysis. The tendon transfer for low ulnar nerve injury with weak pinch involves the long- or ring-finger FDS to the adductor pollicis insertion, with no tendon graft required. When a high ulnar nerve injury is present, the long-finger FDS can be split so that the radial side transfers to the adductor pollicis and the ulnar side loops around the A2 pulley of the ring and small fingers. The ECRB adductorplasty is another option. 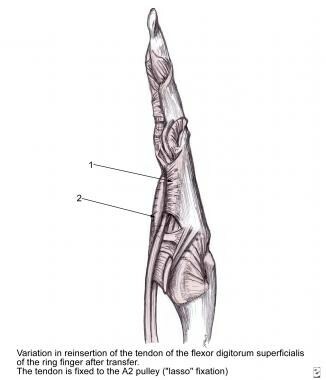 The ECRB or ECRL with tendon graft traverses through the second or third intermetacarpal space volarly across the palm to the adductor pollicis insertion. This transfer doubles pinch strength. Transferring the EIP from the ulnar to the radial aspect of the index MCP joint can strengthen the first dorsal interosseous muscle. Another option is transferring an accessory APL with tendon graft to the first dorsal interosseous or index-finger lateral band. Low median and ulnar nerve paralysis is the most common type of injury and affects the intrinsic muscles. High paralysis also involves the wrist and digital flexors. 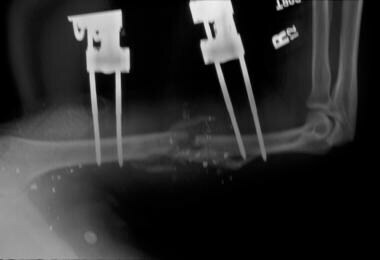 Transferring the ECRL to the FDP and the brachioradialis to the FPL restores digital flexion. Transferring the EIP to the APB is the opposition transfer. An accessory APL with tendon graft to the index finger lateral band provides pinch. For a claw deformity, several tendon transfer choices exist. The intrinsic minus position is hyperextension of the MCP joints and extension loss at the IP joints. The goal is to provide flexion at the MCP joints, thereby allowing the EDC to extend the IP joints. All the tendon transfers for a claw deformity pass volar to the MCP joint. The Zancolli lasso procedure creates a functional dynamic tenodesis in which each FDS is looped around its corresponding A2 pulley to provide flexion of the MCP joints (see the images below). No change in grip strength occurs. This procedure is good for diffuse paralysis or if limited donor tendons are available. The Zancolli lasso procedure, in which the flexor digitorum superficialis (FDS) is looped around the A2 pulley. 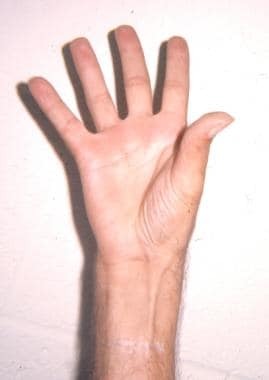 Preoperative photo of a hand with claw deformity. In the same patient, the ring and small fingers' flexor digitorum superficialis (FDS) are dissected free. In the same patient, the A2 pulley is demonstrated with the flexor digitorum superficialis (FDS) retracted. In the same patient, the Zancolli loop procedure, in which the ring finger's flexor digitorum superficialis (FDS) is wrapped around the A2 pulley and then sutured to itself. In the same patient, postoperative photo of a hand following a Zancolli loop procedure. This image shows resolution of a claw deformity. A combined median and radial nerve paralysis injury is usually addressed with a two-stage procedure. Initially, a wrist arthrodesis is performed with transfer of the FCU to the EPL and EDC to provide digit and thumb extension. The second stage involves the Huber procedure for thumb opposition (transfer of the ADM to the APB), thumb interphalangeal arthrodesis, and side-to-side distal forearm FDP tenodesis. Mayer L. The physiological method of tendon transplantation. Surg Gynecol Obstet. 1916. 22:182-97. Bunnell S. Reconstructive surgery of the hand. Surg Gynecol Obstet. 1924. 39:259-74. Pulvertaft RG. Techniques in hand surgery. J Bone Joint Surg. 1960. 42A:907. Boyes JH. Tendon transfers in the hand. Medicine of Japan in 1959. Vol 5, pp 958-69. Paper presented at: Proceedings of the 15th General Assembly of the Japan Medical Congress; April 1-5, 1959; Tokyo, Japan. Morelli M, Nagamori J, Gilbart M, Miniaci A. Latissimus dorsi tendon transfer for massive irreparable cuff tears: an anatomic study. J Shoulder Elbow Surg. 2008 Jan-Feb. 17 (1):139-43. [Medline]. Suttinark P, Suebpongsiri P. Clinical outcomes of flexor hallucis longus transfer for the treatment of Achilles tendinosis rupture. J Med Assoc Thai. 2009 Dec. 92 Suppl 6:S226-31. [Medline]. Núñez-Pereira S, Pacha-Vicente D, Llusá-Pérez M, Nardi-Vilardaga J. Tendon transfer fixation in the foot and ankle: a biomechanical study. Foot Ankle Int. 2009 Dec. 30(12):1207-11. [Medline]. Livermore A, Tueting JL. Biomechanics of Tendon Transfers. Hand Clin. 2016 Aug. 32 (3):291-302. [Medline]. Xu B, Dong Z, Zhang CG, Gu YD. Multiple nerve and tendon transfers: a new strategy for restoring hand function in a patient with C7-T1 brachial plexus avulsions. J Neurosurg. 2017 Oct. 127 (4):837-842. [Medline]. Pinto MC, Johnson JL, Patel HA, Lehtonen EJ, Momaya AM, Brooks WS, et al. The surgical anatomy of the dorsal scapular nerve: a triple-tendon transfer perspective. J Shoulder Elbow Surg. 2019 Jan. 28 (1):137-142. [Medline]. Moreno R, Bhandari L. FCR Interposition Arthroplasty for Concomitant STT and CMC Arthritis. Tech Hand Up Extrem Surg. 2019 Mar. 23 (1):10-13. [Medline]. Brand PW. Biomechanics of tendon transfers. Hand Clin. 1988 May. 4(2):137-54. [Medline]. Chung KC. Tendon transfers. Jebson PJL, Kasdan ML, eds. Hand Secrets. 2nd ed. Philadelphia, Pa: Hanley & Belfus, Inc; 2002. 251-55. Peimer CA, ed. Surgery of the Hand and Upper Extremity. New York: McGraw-Hill; 1996. Floyd WE. American Society for Surgery of the Hand (ASSH) Hand Surgery Update 2. 2nd ed. Rosemont, IL: American Academy of Orthopaedic Surgeons; 1999. Green DP, Hotchkiss RN, Pederson WC, eds. Operative Hand Surgery. 4th ed. Philadelphia: Churchill Livingstone; 1999. Strickland JW, ed. The Hand: Master Techniques in Orthopaedic Surgery. Philadelphia: Lippincott-Raven; 1998. Hunter JM, Mackin EJ, Callahan AD, eds. Rehabilitation of the Hand: Surgery and Therapy. 4th ed. St. Louis: Mosby-Year Book; 1995. Gelberman RH, ed. Operative Nerve Repair and Reconstruction. Philadelphia: JB Lippincott; 1991. Smith RJ. Tendon Transfers of the Hand and Forearm. Boston: Little, Brown; 1987. Trehan SK, Little KJ. Technical Pearls of Tendon Transfers for Upper Extremity Spasticity. Hand Clin. 2018 Nov. 34 (4):529-536. [Medline]. Zachary RB. Tendon Transplantation for Radial Paralysis. Proc R Soc Med. 1946 Sep. 39 (11):722. [Medline]. [Full Text]. Jakubietz MG, Jakubietz DF, Gruenert JG, Zahn R, Meffert RH, Jakubietz RG. Adequacy of palmaris longus and plantaris tendons for tendon grafting. J Hand Surg Am. 2011 Apr. 36(4):695-8. [Medline]. Steindler A. Operative treatment of paralytic conditions of the upper extremities. J Orthop Surg. 1919. 1:608-24. Kallio PK, Vastamäki M, Solonen KA. The results of secondary microsurgical repair of radial nerve in 33 patients. J Hand Surg Br. 1993 Jun. 18 (3):320-2. [Medline]. Brown PW. The time factor in surgery of upper-extremity peripheral nerve injury. Clin Orthop Relat Res. 1970 Jan-Feb. 68:14-21. [Medline]. Omer GE Jr. 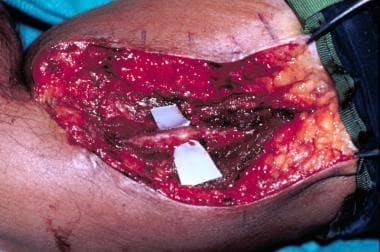 The technique and timing of tendon transfers. Orthop Clin North Am. 1974. 5:243-52. Anderson GA, Thomas BP, Pallapati SC. Flexor carpi ulnaris tendon transfer to the split brachioradialis tendon to restore supination in paralytic forearms. J Bone Joint Surg Br. 2010 Feb. 92(2):230-4. [Medline]. Smeulders MJ, Kreulen M. Myofascial force transmission and tendon transfer for patients suffering from spastic paresis: a review and some new observations. J Electromyogr Kinesiol. 2007 Dec. 17(6):644-56. [Medline]. Spinner M. Injuries to the Major Branches of the Peripheral Nerves of the Forearm. 2nd ed. Philadelphia: WB Saunders; 1978. Goldner JL, Kelley JM. Radial nerve injuries. South Med J. 1958 Jul. 51(7):873-83. [Medline]. Seddon H. Surgical Disorders of the Peripheral Nerves. 2nd ed. Edinburgh: Churchill Livingstone; 1975. Jones R. On suture of nerves, and alternative methods of treatment by transplantation of tendon. Br Med J. 1916. 1:641-3. Tubiana R, Miller HW 4th, Reed S. Restoration of wrist extension after paralysis. Hand Clin. 1989 Feb. 5(1):53-67. [Medline]. Johanson ME, Murray WM, Hentz VR. Comparison of wrist and elbow stabilization following pinch reconstruction in tetraplegia. J Hand Surg Am. 2011 Mar. 36(3):480-5. [Medline]. Aguirre SC, Caplan S. [Sobre secuelas de lesion alta e irreparable de nervios mediano y cubital, y su tratamiento] [Spanish]. La Presa Medica Argentina. 1956. 43:2341-46. Burkhalter W, Christensen RC, Brown P. Extensor indicis proprius opponensplasty. J Bone Joint Surg Am. 1973 Jun. 55(4):725-32. [Medline]. [Full Text]. Royle ND. An operation for paralysis of the intrinsic muscles of the thumb. JAMA. 1938. 111:612-13. Thompson TC. A modified operation for opponens paralysis. J Bone Joint Surg Am. 1942. 24A:632-40. [Full Text]. Foucher G, Malizos C, Sammut D, Braun FM, Michon J. Primary palmaris longus transfer as an opponensplasty in carpal tunnel release. A series of 73 cases. J Hand Surg Br. 1991 Feb. 16 (1):56-60. [Medline]. Kato N, Yoshizawa T, Sakai H. Simultaneous modified Camitz opponensplasty using a pulley at the radial side of the flexor retinaculum in severe carpal tunnel syndrome. J Hand Surg Eur Vol. 2014 Jul. 39 (6):632-6. [Medline]. Hattori Y, Doi K, Sakamoto S, Kumar K, Koide S. Camitz tendon transfer using flexor retinaculum as a pulley in advanced carpal tunnel syndrome. J Hand Surg Am. 2014 Dec. 39(12):2454-9. [Medline]. Diaz-Garcia RJ, Chung KC. A Comprehensive Guide on Restoring Grasp Using Tendon Transfer Procedures for Ulnar Nerve Palsy. Hand Clin. 2016 Aug. 32 (3):361-8. [Medline]. Towles JD, Hentz VR, Murray WM. Use of intrinsic thumb muscles may help to improve lateral pinch function restored by tendon transfer. Clin Biomech (Bristol, Avon). 2008 May. 23 (4):387-94. [Medline]. Stiles HJ, Forrester-Brown MF. Treatment of Injuries of Peripheral Spinal Nerves. London: Frowde and Hadder & Stoughton; 1922. 166. Riordan DC. Tendon transplantations in median-nerve and ulnar-nerve paralysis. J Bone Joint Surg Am. 1953 Apr. 35-A(2):312-20; passim. [Medline]. [Full Text]. Parkes A. Paralytic claw fingers--a graft tenodesis operation. Hand. 1973 Oct. 5(3):192-9. [Medline]. Fowler SB. Extensor apparatus of the digits. J Bone Joint Surg Br. 1949. 31B:477. Zancolli EA. 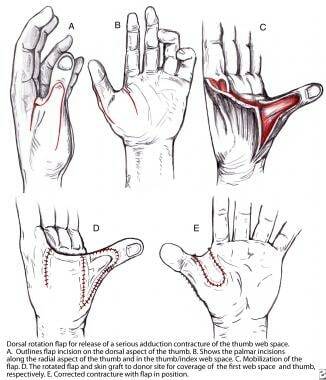 Claw-hand caused by paralysis of the intrinsic muscles: a simple surgical procedure for its correction. J Bone Joint Surg Am. 1957 Oct. 39-A(5):1076-80. [Medline]. [Full Text].